Our DEET-Free Mosquito & Bug Repellant Spray is a combination of anti mosquito essential oils that works very effectively. This product was recommended in the book: “Madagascar Travel Companion” by Sara LeHoullier. Sara recommends Anders Natural Soap Company as a good natural alternative to DEET to bring when traveling in Madagascar. We are very proud of her recommendation, and we think this recommendation has increased our sales as this is one of our most popular products during the late spring thru early fall months. We introduced our “Ecø Repel” line as one of our original products at the inception of our business back in the late 90&apos;s. This is our natural alternative to DEET. This product line has proven to be one of best selling product lines, especially in the summer months. We add a proprietary blend of organic essential oils to the mix to create a synergistic blend that works very effective in the repulsion of mosquitos and any pesky flying critters. It is a real favorite of anyone who spends any time at all in the outdoors. Our organic Black Willow Bark comes from the Black Willow tree (Salix nigra). The extract from this bark contains natural beta-hydroxy acids, including acne-fighting salicylic acid. Salicylic acid, when used in cosmetic formulations at 0.5% to 1%, enhances skin cell turnover by promoting exfoliation, resulting in a general improvement in the appearance of the skin and a smoothing effect with accompanying reduction of fine lines and wrinkles. Also known for its antimicrobial properties, it can be useful as a remedy for problem skin conditions. It occurs naturally in citrus fruits and can also be made synthetically (we use the natural version). It is used to adjust pH levels in cosmetic products. 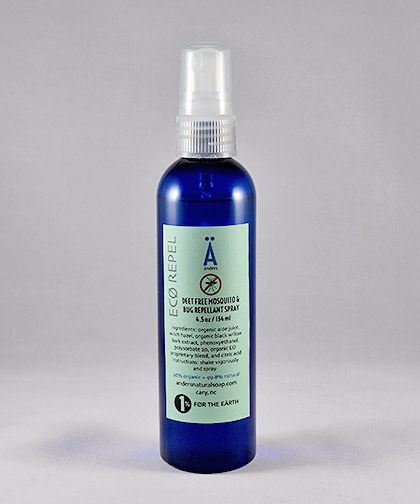 We combine a blend of the most efficient essential oils in the repulsion of mosquitos and pesky flying insects in our Ecø-Repel spray. We use organic therapeutic grade essential oils in this synergistic blend.